Farm house plan features a large country kitchen and a wrap around porch. The ample veranda located in front of this farm house plan, with its central feature invites the passer-by to walk in and share the repose and comfort that exist within. From this veranda we enter the hall “F” of 33 feet, which contains the principal staircase, and affords communication with all the best rooms on this floor. 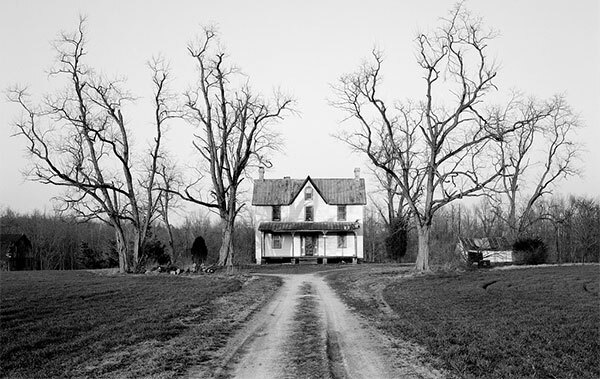 The height of the first story of the farm house plan is twelve feet. Using home design software, such as Punch! Home Design and Landscape Pro, you can plan your ideal home to the last detail so far as proportions, locations of doors, windows, pillars, stairs, kitchen, furniture, fireplaces, bathroom fixtures, and the like are concerned. Location “A”, shown in the farm house plan to the right, is a parlor of 33 feet by 16 feet, entered by folding doors, and is a good example of a regular, well-proportioned room. “B”, 14 by 16 feet, is a library or sitting room, or both, as the requirements of the family may dictate. The chief attraction of this room is the octagonal bay, a very pleasant feature, whether contemplated from within or without. The dining room “D” is 16 by 18 feet, and on occasions of unusual festivity can be extended by throwing open the sliding doors into the room "B". A nice closet to the dining room is seen at “I”, and another for the occasional stowing away of various articles of use or wear. 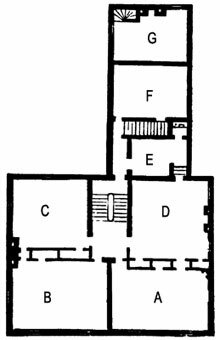 Location “G” in the farm house plan is a passage from the dining room to the kitchen; and “H” a well-sized pantry, is represented as shelved on both sides. From the passage “G” of the farm house, the private stairs extend to the second floor of the back building, which is on a level with the half-pace of main stairs. A passage from the landing of the former communicates with the latter, rendering all the chambers on the second floor easily accessible to servants, without using the exhibited flight of the main stairs. The area “E” is designed for a farm house kitchen, and by its dimensions of 15 by 22 feet, it can accommodate a good old-fashioned country kitchen that our ancestors delighted in. Beyond this is a one-story apartment “N”, 12 by 15 feet, intended for a multitude of uses which will not fail to suggest themselves to those acquainted with the requirements of farm life. The farm house plan to the right features the upper floor. On the second floor, the apartments “A”, “B”, “C”, and “D” are fine, well-lighted and ventilated bedrooms, well provided with closets. 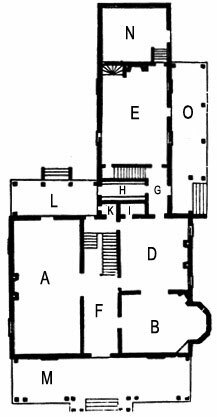 The bathroom of the farm house, “E”, may be reached from the half-pace of main stairs, or by steps from the chamber “D”. “G”, accessible only by a small flight of stairs from the kitchen, may be occupied by a servant or housekeeper,. A cellar under the whole of this farm house is indispensable. Everyone knows the value of this space -- for bins, storerooms, etc. Good attic bedrooms are easily procured by a little additional cost of fitting up. © Copyright 2006-2014, Old House Photo Gallery.